New to our Blog? Click here! In fact, several of them have never even installed the free analytics tool on their websites at all! The second barrier to entry is that it feels like too much math and too much jargon to understand. The sheer amount of data is impressive, aka intimidating. 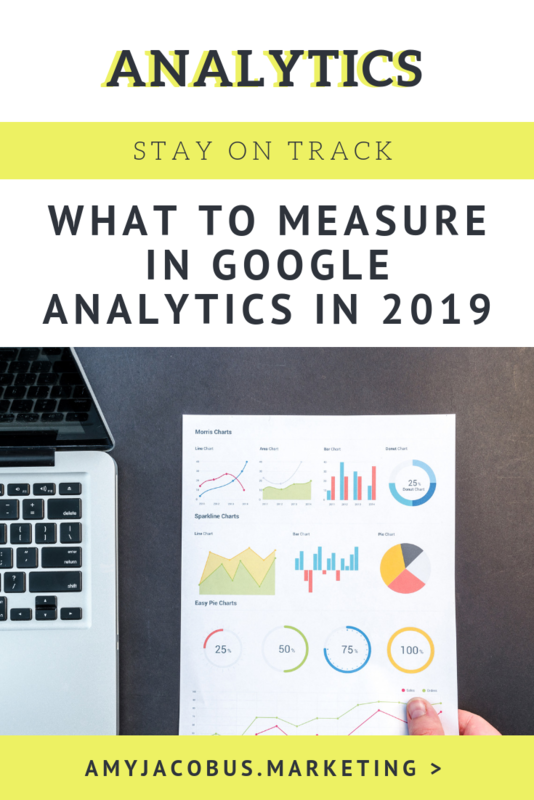 But there are a few things you can and should keep an eye on to ensure you’re on track with your marketing this year. I’ll take you through a few beginner analytics step by step. On a high level, the Acquisition section of your Google Analytics account tells you where your web visitors are coming from. You can see in the pie chart depicted here, my web traffic is pretty evenly split between direct, organic and social. Email and referral sources were much smaller pieces of the pie. It’s a goal of mine to grow my email list this year, and I hope I see an increase in that email portion of the pie for sure. I plan to keep an eye on it. I mean, my email list should be my best engaged audience – the people who want free marketing tips like this one the most. Growing the volume of traffic from email is essential to growing revenue from my paid offerings as well. Scroll down the page and click into Social to learn more about what social networks are getting you the closest to acquiring leads. 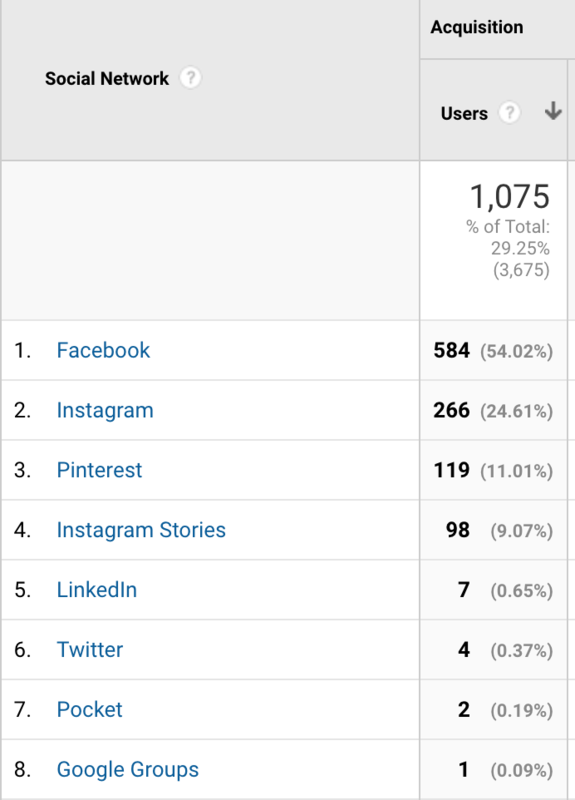 Facebook drives the most traffic to my site, but I can see that Instagram traffic is less likely to bounce right off the site, meaning that those users may be a better fit for my brand. Pinterest was something I tested investing in this year and saw a great return – I can see these are the users that spend the most time on my blog, reading and learning with me. Reading this confirms that I should continue to invest the team’s time and my company’s money on that platform. I can also see that the users who come from Instagram Stories specifically have the highest bounce rate and spend the least amount of time on my site. I’m guessing that’s because my site is super slow on mobile right now, and I’m working to fix that in the new year. See how many actions I can take just by looking at a few numbers?! 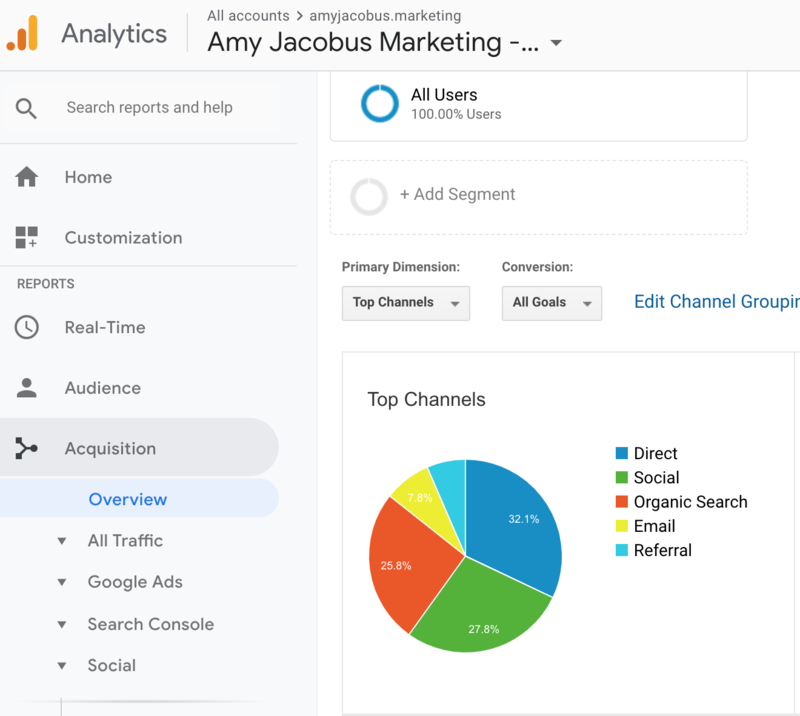 At the overview level, the Behavior dashboard of Analytics will show you your most trafficked pages. Other than my homepage and about us pages, my highest visited pages are my services, freebies and sales pages. 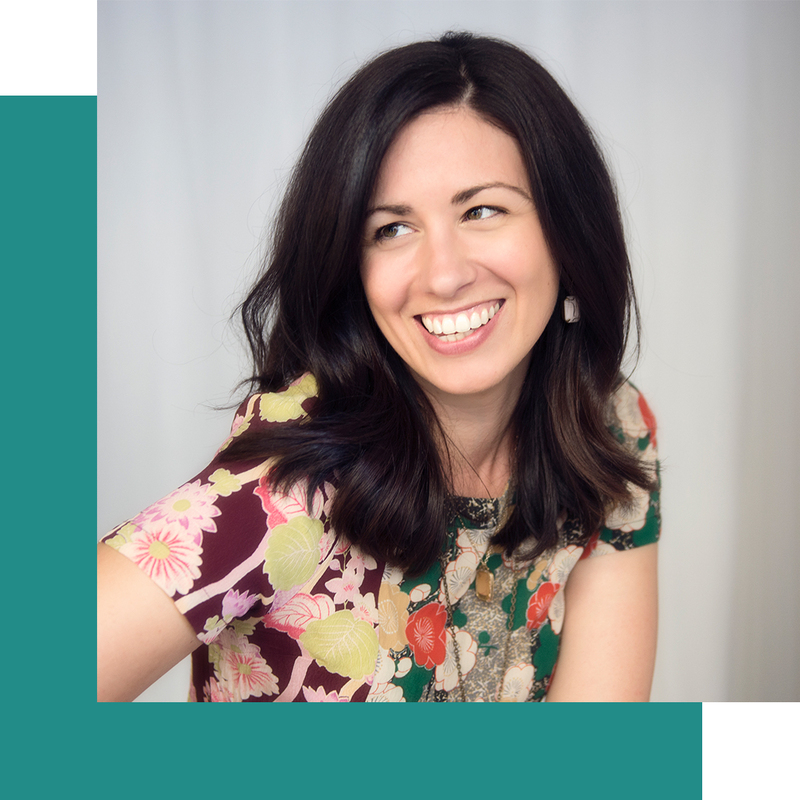 My Start Marketing with Confidence webinar sign-up has a high volume of visits, because I sent traffic there with paid ads, and my blog and Instagram links pages have high clicks because they offer free marketing tips to my followers. You can see that my highest visited page by far is my homepage. So I want to make sure the pathway to my services, classes and sales pages is clear from that landing. Going to Behavior Flow and highlighting the flow of web visitors from my homepage can help me understand what people currently click on and dream up ways I can improve that experience and get them to where I want them to travel with greater ease. Because meet the team is only accessible on the homepage via the main menu, I might remove it from my navigation entirely and just link to it from the Meet Amy page. Keep scrolling to the side to see how people navigate. I can see that some of my most important products – the trio of marketing workshops I taught last summer – are not showing up on this list. So now I can work with my team to amplify that offering on the homepage in any way possible, leading more traffic to that page than others. You can also highlight traffic through specific landing pages you’re using to sell services and products to make sure that the next page they reach is a confirmation of sale or next step to working with you. If they’re not finding an easy way through, you can make adjustments to the page design or content to improve the experience. In 2017, Google found that 53% of people will leave a mobile page if it takes longer than 3 seconds to load. And Google wants people who use their search to get the highest quality results, so they’ll push your content down the list if your site is too slow. Paying attention to site speed is another way to better serve your clients and customers. It’s caring about their experience and making their time with your brand as frictionless as possible. Talk to your web developer or hire IT help to increase your site speed, and you’ll immediately see higher traffic and better engagement with your site. Pro tip: You can also use Google Page Speed Insights and Pingdom to test individual pages on your site and get more detailed information for improving performance.